It has been a whirlwind of activity around here. The finishing of the wedding season at the farm has begun a whirlwind of catch up. From returning phone calls to making appointments to showing the grounds for newly engaged brides, it really hasn't slowed down much at all. One of the nicest surprises this week was receiving a little package in the mail from Japan. I had forgotten that I ordered this postage stamp fabric. Isn't it darling? Ideas are flowing every time I look at it. 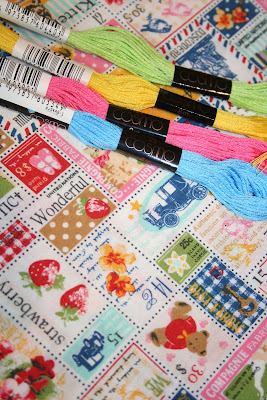 I also purchased a sampler of Cosmo thread from a retailer here in Michigan and it arrived also. A quick trip to the fabric store for more Aunt Lindy fabric found me bringing home this lovely piece of fabric. It had me at "Farmgirl Collection" and at $3.97 a yard, on sale, I couldn't pass it up. 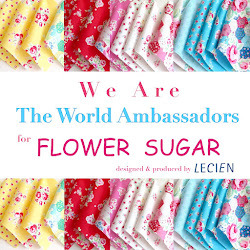 Have you made any fun fabric purchases recently? Lovely fabric.Please share the next project you will use this for. What great fabrics! Love the farmgirl. :-) I recently got some Cosmos to try too~ I really like it. Have a happy day! I have not made any fabric purchases lately as I am trying very hard to behave fabric-wise!! Can't wait to see what you make with it. That is pretty fabric and very neat that it is all the way from Japan. The postage stamp fabric is too cute! 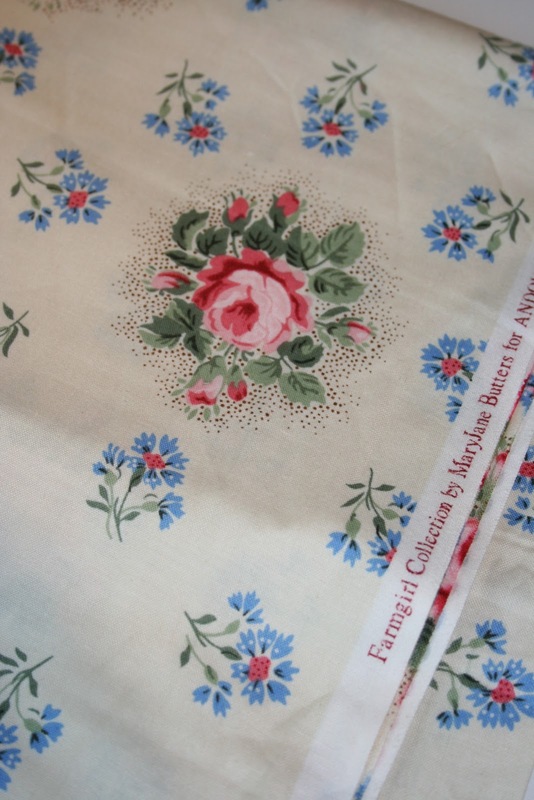 Your floral motif reminds me of Cath Kidston. Cannot wait to see what you do with it. It is so exciting to hear from newly engaged bride's. My sister-in-love (we get along so great it seems wrong to say sister-in-law) is planning a wedding next year and we are having so much fun discussing plans together! Enjoy this slower season, my friend. Loved all your wedding posts this summer. You find the cutest fabric, Renee. Both are fabrics I would have bought too. Love, love the postage stamp fabric. Hurry and show us what you are doing with it. Cute postage stamp material! Looking forward to seeing what you do with it. DD and I are going to "the Big Box Store" today to see what fabrics they have discontinued and are therefore on sale!